The tel has great views in every direction. 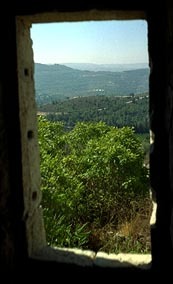 This is looking across the kibbutz orchards toward Jerusalem, on the horizon. 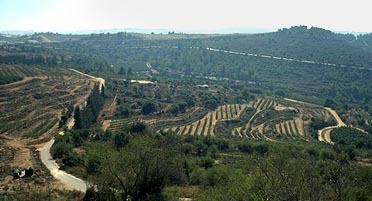 The white slash across the hill in the background is the road from the kibbutz to the Tel Aviv highway. 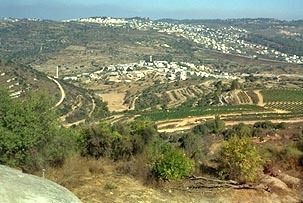 The tel of course also looks out over the kibbutz. In the foreground is the windshield factory. 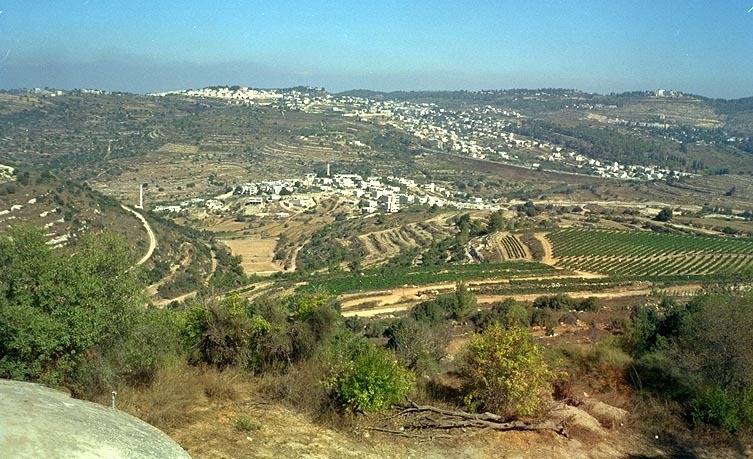 The buildings on the left side of the picture are kibbutz housing; if you look above them you see a hill with some antennas on it, which is Har Tayyasim, the fighter pilots memorial. On the right side of the picture there are long brown sheds, which are the lulim, or chicken coops; beyond that you see some taller sheds (just roofs really), which is the refet, or dairy. Past the refet is Kiftzuba, just outside the entrance to the kibbutz. Between the lulim and the refet is the nagariya, or carpentry. This is looking roughly west from the tel. Click on the picture to see a bigger version of it. Further over to the left, out of the picture, is the kibbutz zoo, open to the public. 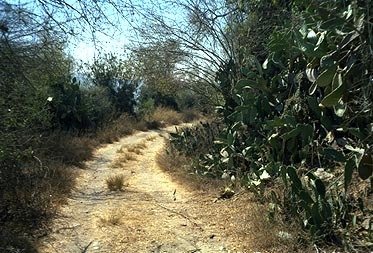 There's still a lot of cactus in the area. It's not so much that it's natural flora for the region--a lot of it was planted because it's a cheap alternative to barbed wire.